The Hawaiian Islands have experienced waves of avian extinctions during Polynesian and European colonization, becoming a hotspot for the loss of bird species. Although the plight of Hawaiian forest birds is well known, conservation issues surrounding Hawaiian waterbirds and the wetlands that support them are less well understood. This presentation integrates the full research of Charles’ doctoral dissertation, which explored the impacts of habitat fragmentation, historical population declines, climate change, and conservation strategies on the extinction risk of the Hawaiian gallinule (Gallinula galeata sandvicensis). Hawaiian gallinules, an endangered subspecies of the Common gallinule endemic to Hawaii, nearly went extinct in the mid-20th century, being extirpated from all but two islands, and have shown slow population increases in the last forty years. Charles’ work has asked whether the species was saved in time, or whether these modest signs of recovery are only temporary. Charles van Rees is a doctoral candidate in Biology at Tufts University and a member of the Reed Research Group, which focuses on using ecological science to inform the conservation of endangered birds. He is trained as a spatial ecologist, animal behaviorist, ornithologist, and conservation scientist, and specializes in studying birds in human-dominated landscapes, especially in the context of wetlands and agricultural systems. 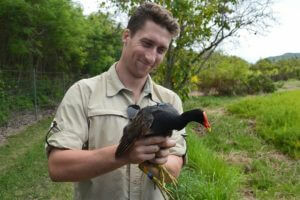 Charles’ PhD dissertation focuses on the landscape ecology and conservation of the Hawaiian gallinule, an endangered, endemic Hawaiian waterbird, and how landscape and climate change have affected extinction risk in this and other wetland birds in the region. He has also published research on improving the link between ecological science and water resources management. Outside of academia, Charles has worked as an advising ecologist for the Livable Hawaii Kai Hui and visiting conservation scientist for the Center for Large Landscape Conservation. He is pursuing postdoctoral training in preparation for a career in international wildlife conservation. For more information on Charles and his continuing work, visit his website www.vanreesconservation.com.